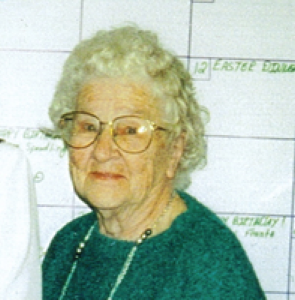 Naomi A. Carey, 93, 103 Edgewood St., Sidney, Ohio died at Fair Haven Shelby County Home, 2901 Fair Road, Sidney, Ohio on Thursday, February 22, 2007 at 2:51 PM. She was born December 15, 1913 in St. Mary&#39;s, Ohio the daughter of Albert and Charity (Stoker) Trost. She married Byron Carey on December 20, 1930 and he died in 1993. Surviving is a daughter, Sue Ann Krouskop of Marshfield, Missouri; four grandchildren and eight great-grandchildren. Also dear friends, Betty and Charlie Bernardi of Sidney, Ohio. One son, Tommy Carey is deceased and also one grandson. Mrs. Carey had served with the Red Cross in Sidney for over 4000 hours in the 1940&#39;s. She was a member of the First United Methodist Church in Sidney. She was a homemaker. Burial will be at Graceland Cemetery and memorial services will be held at the convenience of the family.